I didn’t do any research before I joined my first dating site. I knew pretty much nothing about the platform, how it worked, or what I was in for once I signed up. I created a profile because a friend had spent weeks pressuring me into it, so I was a total newbie fumbling around. As soon as I logged in, I felt overwhelmed. Messages poured into my inbox, notifications alerted me every time someone viewed my profile, and the whole interface seemed like it had way too much going on. I’d jumped into the deep end of online dating without learning how to swim, so I spent a few months figuring out how to stay afloat in a completely foreign and uncomfortable environment. I did get the hang of it eventually and ended up meeting a great guy who I dated for a while — but I could’ve saved myself a lot of trouble and aggravation in those early days simply by learning more about the dating site (or online dating, in general). When you know what to expect, you don’t feel so nervous about exploring new terrain and putting yourself out there on a dating site. Reviews on dating websites can be incredibly helpful to anyone without experience in online dating, especially when the information comes from a trustworthy brand. If you want reviews on dating websites in Australia, DatingSitesReviews.com.au is a go-to source. Australian daters can visit DatingSitesReviews.com.au, a well-known brand dedicated to rating dating websites, to learn more about particular platforms or online dating, in general. This site teaches visitors the basics about dating websites so you don’t have to dive in blind like I did. This comprehensive resource is pretty straightforward: Dating experts review dating websites to save online daters time and stress when choosing from thousands of similar platforms. Whether you’re completely new to online dating or want to compare your dating site of choice with its competitors, DatingSitesReviews.com.au can help you learn more about the pros and cons involved from signing up to matching with someone online. Founded in Germany in 2003, DatingSitesReviews has built an international hub of stats, ratings, and analysis on the top dating platforms worldwide. Spokesperson Liam Hennessy said the brand’s in-depth and detail-oriented reviews regularly satisfy the curiosity of millions of online daters from all walks of life. In total, the reviews sites have seen over 50 million visits and cultivated an international audience. Once DatingSitesReviews took off in the UK, it was only natural for the team to start expanding into English-speaking countries. Australia was high on their target list. In Australia, online dating is an increasingly commonplace way to meet a new love interest. According to a survey conducted by a dating site called RSVP, many Australian singles prefer online dating over traditional ways to meet people, including clubs, vacations, and bars. Since 2000, over 10 million Aussies have registered to dating websites, and 3 million of those are active daters seeking connection online. In such an online-dating-friendly environment, DatingSitesReviews.com.au has flourished. The site provides a rich resource of information on general and niche dating websites. You can search by categories (gay, cougar, religious, millionaire, international, etc.) to find sites that cater to particular types of singles. On the site, it’s easy to compare your options and choose the right dating platform for you. The DatingSitesReviews.com.au team has tested and examined thousands of dating and personals sites (and apps) over the years. The site provides detailed write-ups about the prices, membership base, features, matching system, and other notable aspects of the online dating experience. Many reviews on DatingSitesReviews.com.au share insights bolstered by facts and figures from major dating websites. Sometimes the company receives web analytics from big names in the industry and provides those numbers to online daters, who could benefit from knowing the traffic patterns or gender breakdown of a popular dating site. In the reviews, readers get the inside scoop on what to expect from their dating platforms of choice. And that knowledge can often save singles time and money in the online dating scene. Every six months, the team updates its texts to make sure they cover the latest developments in the dating industry. 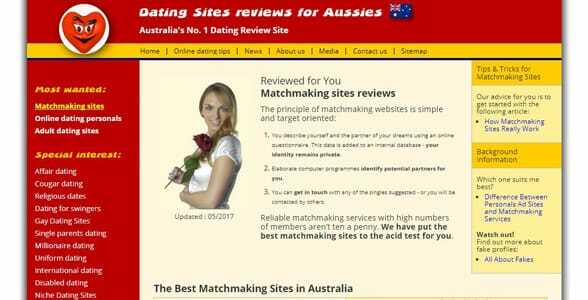 If a certain dating site is no longer operational, for example, DatingSitesReviews.com.au will update the page so it doesn’t direct people to a dead link. Or if a dating app adds a new feature, the reviewer will update the features section to give online daters a complete and accurate look at any innovative designs. A diverse international team maintains a vast online dating resource on DatingSitesReviews.com.au. DatingSitesReviews thrives on reviews, so the customer care team encourages readers to send questions or critiques to [email protected] Such testimonials help the brand grow and better serve its global audience. In total, the company has answered over 10,000 emails from singles for free. DatingSitesReviews.com.au empowers online daters to make informed decisions about which dating platform best suits their needs and desires. This resource helps beginners, as I was once, learn the ropes and get flirting that much faster and easier. If choosing a dating site fills you with uncertainty, you can rely on DatingSitesReviews.com.au to clear up any questions or concerns you may have about any particular Australian dating site or app. This small team has some big goals. 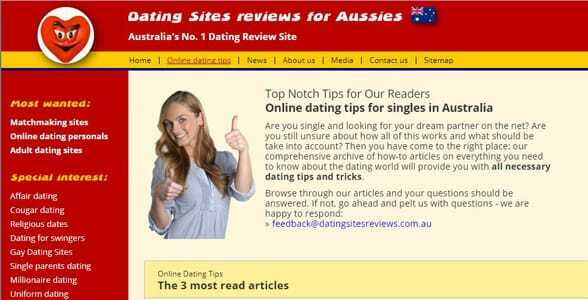 The parent company of DatingSitesReviews.com.au is constantly expanding to new areas and new audiences. Currently, the team is looking to build on their presence in Europe, specifically in Ireland and the Netherlands. Even as the international brand grows its influence, the overall mission to educate online daters remains the same.